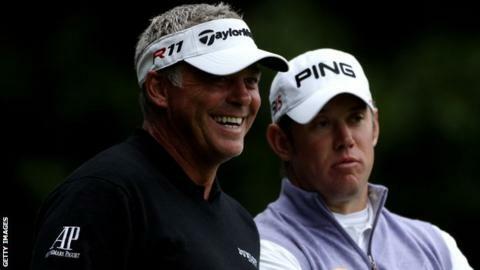 Lee Westwood says his close friend Darren Clarke should be European Ryder Cup captain in 2014 at Gleneagles. Clarke and Paul McGinley are candidates for the role and Westwood says of 2011 Open champion Clarke: "He's a major champion, a very good public speaker which has to be taken into account." Clarke denied Daily Mail reports that he had been offered the post. "To clarify it's not decided by the committee until January," he tweeted. "Would be a huge honour if asked." Westwood recalled Clarke's emotional appearance at the 2006 Ryder Cup at the K Club shortly after the death of his first wife Heather. Chubby Chandler says Darren Clarke has the credentials to be the Europe's next Ryder Cup captain. "The one at the K Club will be remembered for him and his great performance under the stress of what he was going through at the time. "(He's) Tactically very astute. Darren has a lot of things going for him." Englishman Westwood also acknowledged McGinley's leadership qualities, while emphasising his belief that Clarke should land the job. "Paul is good in the team room and makes a great vice-captain. He's done a good job with the Vivendi (Seve) Trophy (twice a winning captain). "Paul has played three (Ryder Cups), Darren has played five and got a major championship and won a lot more tournaments than Paul. "You have to have a criteria somewhere and I think Darren just edges it for me."